Happyesque, 'a journal of ideas and things', has posted an interview with me: 'Historically speaking about Singapore', in which I ponder whether history is cool, how Singaporeans deal with their history (or not) and how I feel about the poor old Padang. There are also some neat photos of the inside of our book. They're also running a competition where you can win a signed copy of our book, if you simply describe Happyesque via Twitter/Facebook/email. Deadline: 13 December. More details are available here. Speaking of the historical imagination, two weekends ago I went on the Jack of Hearts Mystery Tour, a bus tour of some of the shooting locations for the film Saint Jack, the only Hollywood film ever shot entirely in Singapore (and this was back in 1978). 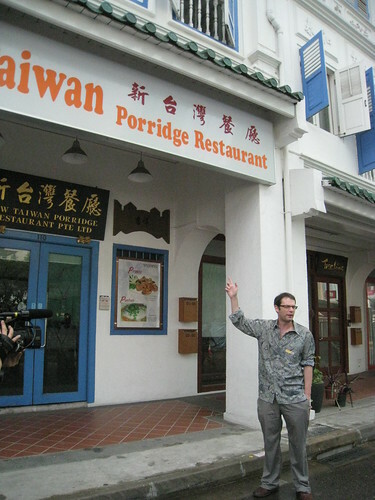 The tour was led by Saint Jack expert and film writer Ben Slater (above), who's meticulously chronicled the making of the film in his 2006 book Kinda Hot: The Making of Saint Jack in Singapore. I didn't really have any expectations of the tour, just that it would be good fun for a public holiday afternoon. But after watching the film on the big screen and marvelling at what a character its Singapore was, then zipping around on the tour in the middle of a suitably moody wet afternoon, I was reminded afresh by how Singapore – as a person or a character, and one worthy of a biography – has experienced what Mark called the civic equivalent of a Michael Jackson-esque make-over. Of the 15 or so stops on the tour (see A Nutshell Review for a blow-by-blow account), only the exteriors of Fullerton Building (now Fullerton Hotel), Raffles Hotel and Shangri-La Hotel are still immediately recognisable. Everything else has been demolished, stripped and/or sanitised. In some locations, such as the shophouse shown above, the dated hues of the streets captured in the film actually exude more insouciant panache than the self-conscious hyperreality of today's "conserved" and regularly repainted buildings. And all this, since just 1978. Of course, Saint Jack is no documentary and it plays up a certain seedy, exoticised Singapore that suits its purposes. At the same time that the film crew was mucking about in overcrowded Chinatown and colourful Bugis Street, some Singapore families were adapting to new and neat HDB housing estates, while others were living in relatively undisturbed kampungs. Our book only briefly describes Singapore in the early 1970s, but if we were ever to go back and extend that epilogue into a full section, it would not be merely Singapore-the-charming-rogue that defined that decade. Although it would be deliciously tempting, from a storyteller's point of view, to let him do so.